Well-known marijuana prohibition activists such as Mary (Brownie Mary) Rathbun, Dr. Tod Mikuriya and Jack Herer have passed away and along with them their own stories and histories on their work to legalize medical marijuana. Many other early activist’s stories are at risk of being lost if no effort is undertaken to record them. 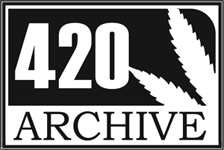 The 420 Archive is interviewing those on the front lines of the movement in the 60s and 70s making sure their memories of events are recorded and preserved. Pebbles Trippet is a lifelong advocate for marijuana legalization & medical cannabis. Co-founder of several organizations, including Medical Marijuana Patients Union, Mendocino Medical Marijuana Advisory Board. Marijuana defendant turned litigant, challenging the constitutionality of the marijuana transportation laws for lack of medical access, ending in victory with People v Trippet which set the current quantity standard for medical patients, i.e. whatever is reasonably related to the patient’s medical condition.